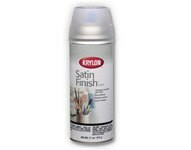 Provides a permanent, protective satin finish that will not yellow with age. Moisture-resistant and smudge-proof. Protects art, crafts and valuable. Dries fast and clear. 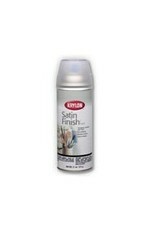 Permanent, protective satin finish. Non-yellowing. Moisture-resistant. Dry to touch: 10-15 minutes. Dry to handle: 1 hour. For use on: Paper, Plastic, Dried Silk Flowers, Paper Mache, Ceramic, Plaster, Glass, Metal, Wood.